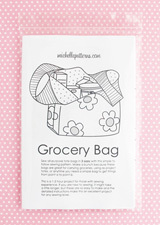 Here's another Grocery Bag in a print that has been kicking around my stash for at least 3-years! Maybe my subconscious tells me to hoard these until the fabric is OOP (out of print)? This is the medium size from the pattern, and the finished bag is for sale in my etsy shop should you need to make it yours. The fabric is a print called Venice from the Victoria and Albert Museum Collection for David Textiles. The black and white polka dot print used for the handles is probably Dottie from Moda, and the lining is a black and white stripe with a touch of sepia from Quilting Treasures. It's been a while since I've sewn one of these, but here is a clutch I made with a sweet Michael Miller print called Elvira. The pouch part is made from a brown and cream polka dot print of mysterious origins. The FQ I picked up didn't happen to have the selvedge section with the manufacturing info. The button is 1.5". I'm going to make more buttons very soon! At the beginning of the year I started setting up a separate shop exclusively for the buttons, but now I see that another shop is folly on my part. I have enough going on already and will add more buttons to my etsy shop. The inside is lined in a big pink polka dot print from Fabric Finders. A few weeks ago I needed some 1/2" hexagon paper pieces, but didn't want to run out to the fabric store. Sometimes they don't have all the sizes in stock, which made me feel even less motivated to make the drive. But I still wanted those paper pieces, and I started thinking about how they could easily be printed at home if I took the time to make some printable sheets. So I sat down and made a document with 1/2" hexagons shapes, and since these are fun to paper piece in any size, I thought I might as well make pages for them in a bunch of sizes! Print the hexagons on 67lb Vellum Bristol paper. This is the same weight paper as pre-cut hexagons, and a ream can be found in almost any office supply store. 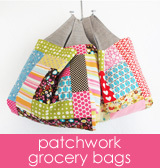 This paper is also fantastic for printing out your sewing pattern pieces! It's stiff enough to easily trace around the outline and your pattern pieces will last longer than ones printed on regular printer paper. If you like to paper piece hexagons, or want to try (it's really relaxing), you can order a copy of this document. Then you'll always have easy access to paper pieces in a variety of sizes and can just print them out as needed. Yesterday afternoon I had some time to sew, so I made this clutch. This was made with these pattern pieces, and pocket #1 from this document. I'm getting down to mostly scraps of the fabrics I usually use for lining, so not only is it fun to have patchwork lining, it's keeping me out of the fabric store for a few more days! Today is the final Skirt Sew Along post and I'll go over how to line this skirt. Besides looking very nice, and keeping the skirt from sticking to your legs and creeping upward if you are wearing tights, lining also gives some structure and can help with the overall look of the finished skirt. It will also help with wear and tear and help your skirt last longer. Many stores have a selection of fabrics that are made specifically to be used as linings, but other fabrics can also be used. As long as it's comfortable, light enough that it won't interfere with the way the skirt hangs, and has the properties you need in a lining, you can experiment with other fabrics as linings. Most of the time the reason I'm lining a skirt is because I want it to be silky on the inside, so I use Bemberg rayon. Bemberg rayon is sold in many stores under the brand name Ambiance. It's a natural fabric that is breathable, feels soft and comfortable, it can be machine washed/dried (even though it says Dry Clean--it's washable), it's anti-static and wrinkle resistant. It's around $8-$9 per yard, so it is kind of mid-range price wise and there are some less expensive synthetic options. Joann's does carry Ambiance, and I forget how their coupons work, but if you have one of their coupons that will help with the price. The lining fabric doesn't need to match your exterior, so if get a few yards in a color you like, it can be used in a couple different skirts. For the most accurate amounts, layout your pattern pieces to see how much you need. 1. Cut out the A & E pieces from the cotton fabric and interfacing. You might be wondering why not use the silky lining fabric for these pieces and the answer is that it's not very stable. You could use a lining fabric, but it's going to much harder to sew and will probably start coming away from the waist eventually. 2. Cut the B piece, but without the pockets and make it 1" shorter. Trace B on the fabric and then use the top corner of C to fill in the curved top corners. To make it shorter, you can move the pattern piece up and trace off the bottom edge 1" higher. The lining needs to be at least 1" shorter or when you sit down it will show. 3. Cut the F pieces and also make them 1" shorter. 4. Apply the interfacing to the WS of the A & E pieces. 5. Sew A/B together using a 3/8" allowance. Using the smaller allowance will help offset the seams between the exterior and lining. 6. Press the SA down to the B side this time and topstitch. Pressing it down will also help offset the seams between the exterior and lining. The topstitching is to help finish the lining seams and prevent fraying. You can also pink them to help prevent any fraying. 7. Sew the E/F pieces together using a 3/8" allowance. 8. Press the SA down to the F side and topstitch. 9. Sew E/F panels to A/B. 10. Press the side seams to the E/F side and topstitch. 11. Trim the bottom if needed. I fold the lining in half and then trim any spots that are obviously off. 12. Press the bottom edge to the WS 0.25" and then another 1". 13. Stitch most of the hem in place, but leave 2" on each side unsewn. It's much easier to hem the lining now, but the CB is sewn last, so you'll want to be able to unfold the hem to sew that seam. 1. With the skirt RS out, wrap the lining around the outside so the fabrics are RST. 2. Sew the lining to the top of the skirt. 3. Turn the skirt WS out and match one side of the lining to the CB seam next to the zipper. 4. Fold the SA down at the corner and pin. 5. Attach your zipper foot and sew the lining down next to the zipper. 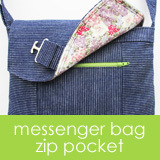 It can be hard to sew down the folded corner with the zipper foot. You can try backing into it by beginning below the corner and backstitching. Or sew the lining to the zipper below the corners and then switch back your regular presser foot and sew the corners. 6. Repeat 3 - 5 for the other side of the lining. 8. Sew the bottom CB seam. Just like when we sewed the CB of the exterior, try to get as close to the bottom of the zipper as you can, but it's not as important to close the gap here. Backstitch well below the zipper. 9. Refold the hem and stitch the rest of it down. 10. Turn the skirt RS out and tuck the lining down inside. 11. Push out the top corners next to the zipper. If they won't push out neatly, trim away some of that folded down allowance from step 4. 12. Press around the top. You can leave the lining hanging freely, or hand stitch it to the allowance in a few place.